A year ago I decorated my nails with some blue roses. 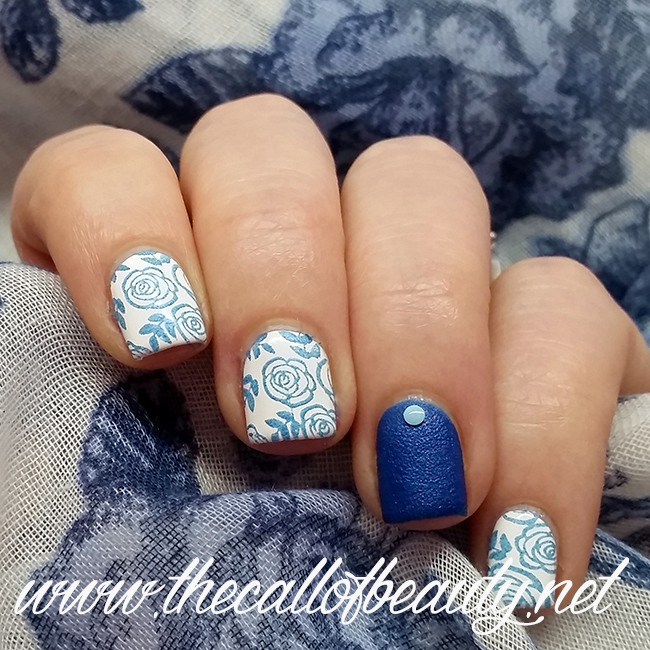 As always I added an accent nail in blue but stamping hides a secret. It is done with a textured polish, you can find all details in the original post at this link. Un anno fa ho decorato le mie unghie con delle rose blu, accent nail come mio solito ma lo stamping cela un segreto. Infatti è realizzato con uno smalto textured, per sapere tutti i dettagli trovi il post originale a questo link. Some nice floral stamping this is! Wow, you managed to stamp with a textured polish!!! I've always thought it wouldn't work, so I'm amazed that you were able to pull it off! It looks fantastic! JUst have a try with a bold color! It will work!